The rapid increase in the number of injectable drugs to be approved recently has been a key contributor to the growth in demand for disposable syringes specifically, over other types of syringes. This is due to the growing number of patients afflicted with accidental needlestick injuries. Both factors thus work in tandem to create a staggering demand for disposable syringes and will continue to do so in the long term. The number of disposable syringes being used has also increased due to the growth in point-of-care administration systems. These systems promote the self-administration of drugs, which can be easily done with modern disposable syringes with improved safety features. The effective result of the above factors of influence on the market – along with a few others – for disposable syringes is expected to translate to a CAGR of 5.6% from 2015 to 2023. This market is expected to be valued above US$9.3 bn by the end of 2023 and close to US$6.5 bn by the end of 2016. By the end of 2016, North America disposable syringe makers are expected to gain a revenue of US$3.9 bn, which is close to half of the total revenue earned on a global level. 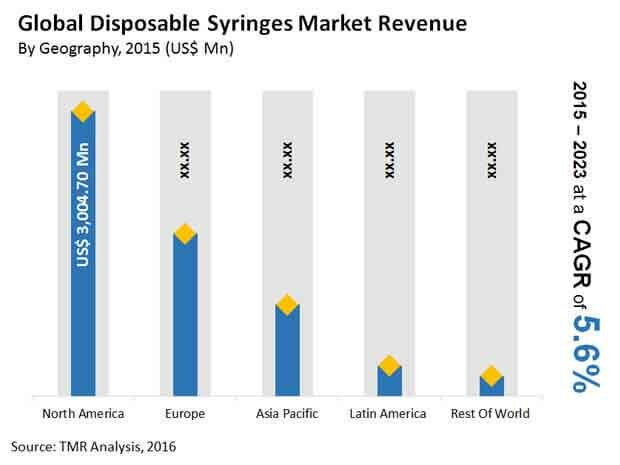 North America is expected to maintain its dominance over disposable syringes revenue till 2023, although it is expected to lose some percentage to the burgeoning Asia Pacific market. Europe will remain the second-largest region for disposable syringes till 2023. Both North America and Europe are showing a high demand for disposable syringes due to the growing number of injectable drugs in the market, improvements in syringe quality and safety through regulatory adherence, and the concern over a growing number of needlestick injuries. China and India are expected to be the two key lucrative avenues for disposable syringes players in the near future, owing to their high population densities and growth in healthcare expenditures. A large part of this growth in demand for disposable syringes is attributed to the increasing number of government and private initiatives for conducting immunization drives across the countries. Additionally, the higher interest shown by North American and European players in these regions is expected to add to the quality of disposable syringes available in the market, further increasing their consumption rates. Conventional disposable syringes have held the larger share by volume till now, and will be expected to hold the dominant share for a few more years. However, the segment is expected to lose its leading position to safety syringes which are gaining popularity at a rapid pace. Safety syringes already lead the market in terms of value. By 2023, safety syringes are expected to hold a revenue share of 84%. Key reasons for the high accelerated growth rate shown by safety syringes is the absence of any safety mechanisms in conventional ones. Safety syringes help protect patients from needlestick injuries and are just as accurate and easy to use as conventional disposable syringes. The top manufacturers of disposable syringes in the world today include Becton, Dickinson & Company, B. Braun Melsungen AG, Medtronic plc, Terumo Corporation, Smiths Medical, and Retractable Technologies, Inc. This report on the disposable syringes market studies the current and future prospects of the market across the globe. Syringes have made possible the delivery of medicines via parenteral means such as intravascular and intramuscular. Disposable syringes have been preferred than re-usable syringes majorly due to low cost, accuracy, sterility, and ease of handling. The market report comprises an elaborate executive summary, which includes a market snapshot that provides information about various segments and sub-segments of the market. It also provides information and data analysis of the global disposable syringes market with respect to market segments based on the product type and their geographic analysis. Based on the product type, the disposable syringes market has been segmented into: safety syringes and conventional syringes. Safety syringes have been further classified as automatic retractable syringes, manually retractable syringes, non-retractable syringes and auto-disable syringes. Conventional syringes comprise with needle and without needle. Each of the market segments have been extensively analyzed based on adoption rate, awareness, advantages, efficacy, revenue, and geographical coverage. The market size and forecast in terms of USD million for each segment has been provided for the period from 2013 to 2023. The report also provides the compound annual growth rate (CAGR %) for each market segment for the forecast period from 2015 to 2023, considering 2013 and 2014 as base years. Geographically, disposable syringes market has been segmented into five major regions: North America, Europe, Asia Pacific, Latin America and Rest of the World. The market size and forecast for each of these regions has been provided for the period from 2013 to 2023, along with their respective CAGRs for the forecast period from 2015 to 2023, considering 2013 and 2014 as base years. The report also provides with market size and forecast for major countries in the respective regions. The research study also covers competitive scenario in the mentioned regions. A detailed qualitative analysis of factors responsible for driving and restraining the market growth and future opportunities has been provided in the market overview section. This section of the report also provides with market attractiveness analysis, Porter’s Five Forces analysis, and market share analysis by key players, thus presenting a thorough analysis of the overall competitive scenario in the global disposable syringes market. A list of recommendations has been provided for new entrants as well as existing market players to assist them in taking strategic initiatives to establish a strong presence in the market. The report also profiles major players in the market based on various attributes such as company overview, financial overview, product portfolio, business strategies, and recent developments. Major players profiled in this report include B. Braun Melsungen AG, Becton, Dickinson & Company, CODAN Medizinische Gerate GmbH & Co. KG, Gerresheimer AG, Covidien (Medtronic plc), Retractable Technologies, Inc., Star Syringe Ltd., Smiths Medical, Terumo Corporation and Unilife Corporation.